Sylvie and her mum, Ritz, came for a short holiday at Carolake. I was so impressed by this lovely chunky puppy, her confident attitude and her beautiful conformation. 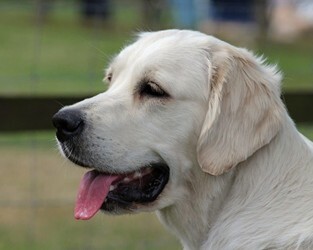 Luckily her breeder, Diana Cruttwell, agreed to let her stay and become part of our family. I look forward to campaigning her. Sylvie has made a very good first impression in the show ring, winning three Best Puppy in Breed, two Best of Breed, Gundog Puppy Group 1, Reserve Best Puppy in Show as well as qualifying for Crufts 2015 and also qualifying for Hampshire Top Dog 2015. She has fitted in well with the other girls at Carolake and proved she can pick fur (a dead rabbit) and feather (next door's duck! returned unharmed), so she may have a future in the field as well as the show ring. Sylvie gained her Junior Warrant and Stud Book Number with ease. This means she is qualified for Crufts for life. 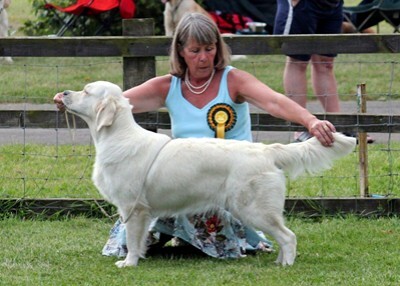 At the Golden Retriever Club championship show in July she won her last class as a puppy and was Reserve Best Puppy in Show, an excellent way to complete her puppy career. A litter of puppies from Bliss has kept everyone at home, along with a rather drastic change of coat. Once she is full coat she will return to the show ring, but for the moment she is having a well deserved break.